Surgery can be a stressful time, even for adults. It can be even more stressful and terrifying for kids, who don't really know exactly what's going to happen and who are suddenly surrounded by people in blue scrubs and wires. The Doctors Medical Center in Modesto, California, have come up with a creative way to help with some of that anxiety. They let young patients drive themselves to surgery in a small, pink Volkswagen Beetle, or a black Mercedes. "Check it out! Doctors Medical Center has made another addition to our paediatric surgical program. Last year, we introduced our little black Mercedes. Now we have a pink Volkswagen Beetle! These sweet rides take our smallest patients to the operating room. The goal is to reduce anxiety and stress, and make the experience less scary for everyone involved. Doesn't hurt to have options, right?" The black Mercedes was introduced by the hospital last year and proved so successful that an employee and their family decided to donate the pink Beetle. 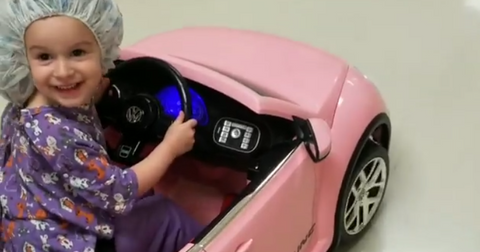 The hospital even posted a video of one of their patients riding the car, writing: "With a little passenger in tow, Caroline takes our new pink Beetle for a spin! Doctors Medical Center now has two little cars available for our young surgical patients to ride into the operating room. We can see the stress and anxiety melt away when they hop in the car." Facebook users seemed to love the idea behind the cars. "It's wonderful to see a smile instead of worry/fear," one person commented. Another added: "Way to go, this is so wonderful." Several people offered to donate cars to the hospital to add to their fleet, with the hospital encouraging anyone with a donation to send them an email.